Home » Messi an absolute genius: Rahul Dravid in all praise after Camp Nou. Rahul Dravid who was at Camp Nou to witness an “electric atmosphere” of a La Liga clash between Barcelona and Atletico Madrid, was completely in awe of Lionel Messi. “It’s incredible, it’s a huge honor, it’s always one of the things I always wanted to do –come to Camp Nou and watch a match. To be here and experience the atmosphere, it’s absolutely electric. To be able to watch players like Messi and Suarez play live; it’s fantastic for me and my family. Thanks to Barcelona FC for the hospitality, it’s been excellent “, David said in an interview on fcbarcelona.com. While the Blaugrana dominated rivals Atletico in what could have been the decider of the title race, Luis Suarez and Lionel Messi with their brilliant scores led Barcelona to an amazing victory. 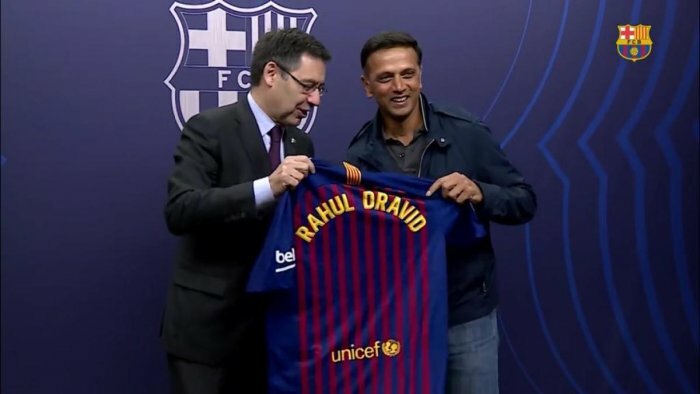 After the match, Dravid met with FC Barcelona president Josep Maria Bartomeu and was handed a Barca jersey with his name printed on it. Dravid was in all praise for Messi and called him an “absolute genius”. “He is an absolute genius. It is incredible to watch what he does and to watch him live. It is fantastic to see how good he is with the ball and see how well he is without the ball and how he is able to find spaces. I don’t think there is a better player than him ever”.